For the past few months I have been part of the SFU Radius Fellowship of Radical Doing, a program that brings together 16 social innovators from across Metro Vancouver to elevate our leadership skills, accelerate our personal development, expand our personal networks, and build connections across the Greater Vancouver social innovation ecosystem. A few weeks before the end of our fellowship on May 15th 2018, we participated in ConcAUCTION, the annual Radius Fellows celebration and networking auction. At the event, each of the 2018 Fellows made a 60 second pitch in which we talked about our work and made a specific ask of the crowd that required human expertise. We all had numbers on us, and once we had made our pitch, audience members indicated through post-it notes that they wanted to talk to us. In between and after the pitches, we then zipped around to find all the people with our number. If we couldn’t find each other or if an audience member had to leave, they could leave us a note in our mailbox. I was nervous before the event because I prefer being in and having conversations in small groups. A few weeks previously however, through Radius a small group of us had taken a daylong habits course with a leadership educator named David Kohler, and in the course David offered that we are all a collection of habits, and that everything we know about ourselves is information about our habits. Therefore, he suggested, “We can change our understanding of ourselves through changing and expanding our habits”. Be specific. I’m a career and experiential educator, and when I speak about informational interviews or career conversations at work, I often tell students to be specific in what they are looking for. Despite giving that advice, before ConcAUCTION I found it difficult to drill down to exactly what I was looking for. I knew I wanted to increase the audience of the Seriously Planning blog, YouTube channel and podcast, but I didn’t want just people who love books to check out the project, I also wanted to encourage people to read. Practicing talking to others was helpful because they could let me know whether or not what I was asking for was clear. I’m looking for advice from bloggers/podcasters/YouTubers and digital strategists on how to increase the reach of the Seriously Planning channels and make them economically sustainable because I’d love to make digital storytelling my full-time work. Once I felt internally clear, the whole event felt so much easier. I felt rooted in why Seriously Planning matters to me and I felt clear about my ask, and as a result, the conversations that I had with people that day felt easy, exciting and energizing because they were about things that I care deeply about. ConcAUCTION taught me that instead of networking being an exercise in marketing myself, I just need to stay true to what I care about and meaningful conversations will follow. 2. Talk to friends of friends. Because everyone at ConcAUCTION had chosen to be there and liked/Radius, it felt like everyone there was a friend of a friend. Everyone felt interesting because they had voted with their feet and time to spend their evening with the Radius community. It felt like a welcoming and warm community, and moving forward I want to spend more of my time connecting with people who are doing things I’m interested who are already connected to other people in my network. 3. Do it with others. This event felt doable because we had so much support. The Radius team and staff were there for us, there were sixteen of us going through the same experience and there were friends and family and colleagues and coworkers in the audience as well. Instead of feeling like it was just us individually going through sixteen separate experiences, we all were helping each other practice, refine what we wanted, and cheering each other on. It is the way I want to network and build community in the future. 4. An abundance mentality makes for more confident career exploration. Sometimes networking can nerve-wracking because it feels like it is a zero-sum game and a competitive space. But ConcAUCTION had the opposite vibe. 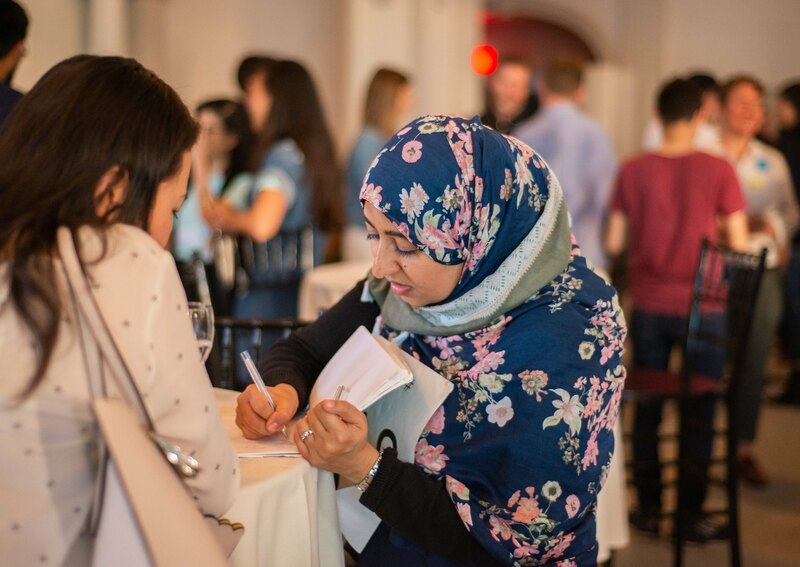 It felt like a deeply generous space with deeply generous people and I found myself making connections between what people were saying to me with what I knew about the interests and work of the other Fellows. Because I knew what I was interested in and what I was looking for, it felt like if a conversation was meant to be or if I was meant to meet someone, we would find each other. That sense of purpose and non-competitiveness made for a deeply interesting and energizing night, and has changed the way I look at career conversations and networking moving forward. Overall, ConcAUCTION was an incredible experience. I met incredible people open to working together in a variety of ways, and some of the offers/suggestions were literal dream projects of mine. And if you were at ConcAUCTION 2018 and we didn’t get a chance to meet, or the work/asks of Seriously Planning speak to you, please say hello. I’d love to chat.